The implementation of this coal based project started in June 1986 and was completed in record time. The plant was commissioned with LURGI’s assistance on 30th April, 1989, and the commercial production started from 1st July 1989. The unit was setup to produce Direct Reduced Iron (DRI), the basic raw material for steel industry, with an installed capacity of 1,50,000 tons per annum using iron ore and non-coking coal. The plant’s capacity has since increased to 210,000 tons per annum. 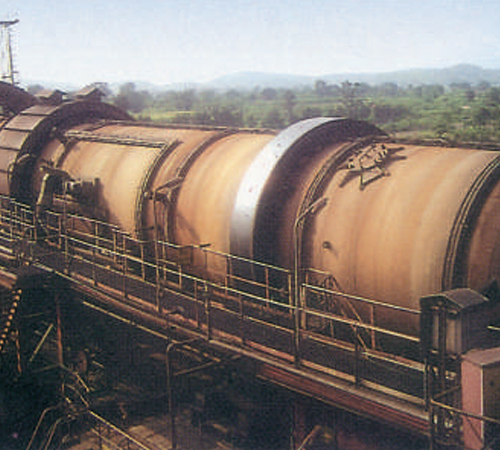 BSIL modernized the plant with the objective of efficient use of Iron ore and coal, by reducing wastage. Besides, three Kiln – one of 500 TPD and Two of 100 TPD each, two Power Plants, Turbo Generator supported by a fluidized bed boiler, of 5 MW each takes care of power requirement. It is based on Coal Char coming out of Kiln for economical generation of power. One 6 MT Induction Furnace using electrical energy produces Ingots of high quality. Sponge Iron produced is used as a mix Raw Material for producing Ingots. Plant also has one Cone Crusher for Iron Ore lump to be converted to 5-20 MM size. One Jaw Crusher is used for sizing the Iron Ore. Magnetic separator is used for improved feed to power plant. The plant is adequately supported with utilities – Cooling Tower & Water softener. BSIL has its own Railway siding which makes the movement of incoming & outgoing easy and economical. Railway siding is long enough having double track to serve the need of both the raw material - Coal & Iron Ore simultaneously. The Project based on SL/RN rotary kiln process of Lurgi which is the best Coal based technology globally. Sources of make up water, for the sponge iron plant of Bihar Sponge Iron Limited Chandil, are ground water from bore wells location within the plant boundary and surface water from the River Swarnrekha. Water drawn from Swarnrekha river. The location of the plant is strategic. Located on National Highway, it has excellent connectivity to Ranchi, Jamshedpur, Kolkata and other parts of India. It is well connected by Rail and Air. The plant is located in tribal area of Jharkhand. Five villages surrounding the plant having population of 7000+ were adopted by the company for the upliftment of the tribals & villagers. The company provides the basic amenities like clean drinking water, sanitation, primary health services, modern school and residential colony. A modern Guest House with comfortable rooms and dining facility has been built near the plant. The company has encouraged employment to local villagers and tribals supporting large number of families of villagers in Chandil area. Mr. Umesh Kumar Modi , the youngest son of Late Rai Bahadur GM Modi had a vision to develop tribal area and provide employment and growth opportunities to tribals. He has spent long time and put in best efforts to build the plant and infrastructure around that. Mr. UK Modi has a vision to develop the area into an educational hub. The education is the best vehicle for upliftment of the villagers. He is creating a trust for building educational facilities such as B.Ed, B. Pharm and other employment oriented courses on par with the best in the country.